OK, so now that you all know what the Folger Shakespeare Library is, it's time to come with me on a very special tour... into the depths of the Folger's vault! Yes, somehow the Folger had mistaken me for an actual important person and arranged a private tour of the otherwise inaccessible vault for me. My guides on this expedition were the wonderful Abbie Weinberg and Alan Katz. Once again I exaggerate. Alan and Abbie were, in fact, extremely tolerant and even encouraging of my high-pitched noises of over-excitement and general flailing. First quarto of King Lear, with extremely busy title page! First Folio! Right in front of me! Not hiding behind a glass case! Close-up of the cover of the Bishops' Bible that was in Queen Elizabeth's private chapel, including her marks engraved on the clasps and other hardware. Yes. I booped a First Folio. You can actually turn the pages and everything, but I was far too nervous to do that, so I settled for a tiny boop in the margins of the Good Tickle Brain page. Also, before you ask, no you don't have to wear gloves when you handle a Folio. Apparently the lack of tactile sensation in your fingers when you wear gloves actually causes more damage to the pages than the oils in your skin. So I have now made skin-to-page contact with a piece of paper that came off Jaggard's press in 1623. It was pretty amazing. 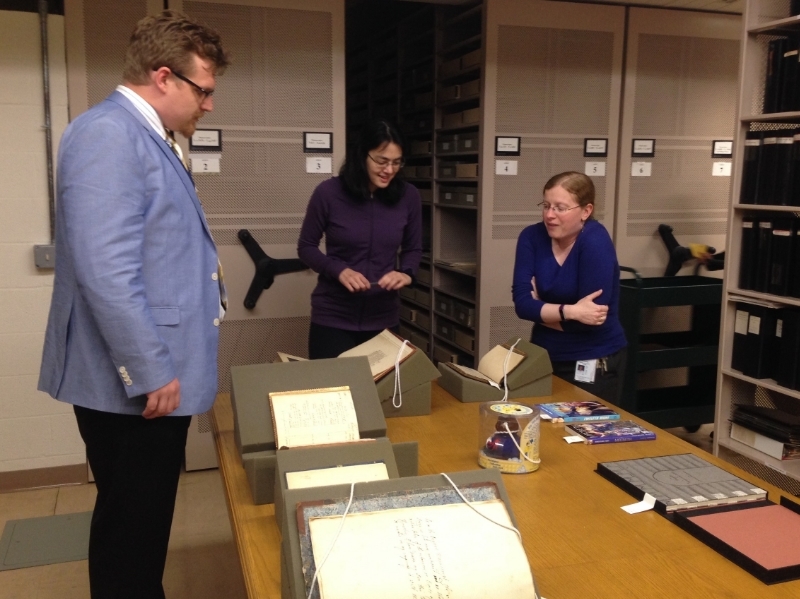 Tune in again next week as I wrap up my fantastic adventures at the Folger, including a few more unexpected gems in the vault and a summary of my Free Folger Friday talk!